– the launching speed of packed applications. The launching speed was improved in times, especially for applications that include thousands files in Virtual Box. Symptoms of previous versions – much time between you click to run the application and when it finally executed. – during continuous improvement of the Virtual Box core, we have fixed some other problems that caused unexpected behavior of packed application under specific versions of Windows. The scheme where a license key is provided to a registered user is often used upon selling software over the Internet. The Enigma Protector suggests flexibility in the integration of a license verification system based on cryptographically strong asymmetric algorithms into software and license (registration key) generation systems. Here, strong means that the complexity of algorithms used for registration key generation is comparable to the RSA algorithm with the key length up to 4096 bits. Many programmers make a mistake trying to implement algorithms for license validation and generation themselves, or misuse the ready-made solutions. This allows hackers to create their own license generators (key generators), which surely does not stimulate sales. The Enigma Protector will eliminate these threats as no one except yourself will be able to generate licenses for your applications. A registration key generation system can be easily embedded into automated registration systems such as ShareIt!, RegNow, Plimus, and others. 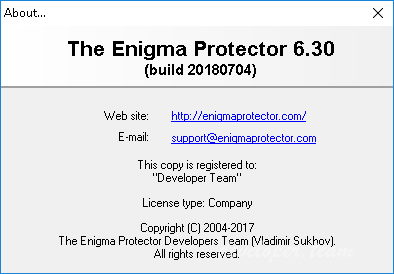 Furthermore, the Enigma Protector can restrict the use of a license to a particular computer through adding information about the user’s computer into the registration key. These registration keys will only work on one specific computer. The Online Activation Panel is a web-based solution for tracking and consolidating all incoming orders for your applications, automating and processing product registration or online activation if any. Each time your customer makes an order for your software product, the Online Activation Panel tracks and locates that order in its database, takes care of the product’s online activation or makes sure that the registration key is generated and submitted to the customer without any your attendance. – Complete order management, including handling stolen and refunded orders, adding orders to the order database manually, etc. – A user runs the application that shows the Hardware ID. The user submits the Hardware ID to the developer via e-mail, fax, etc. – Based on the user name and their Hardware ID, the developer creates a registration key and sends it back to the user. – The user enters the registration name and key into the program and registers it. 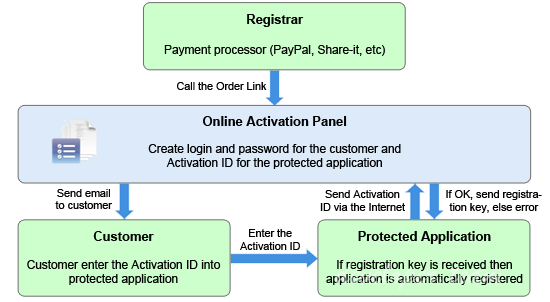 – A user runs the protected application, enters a short activation number (that the user received when purchasing the program) and clicks Activate. – The program automatically connects to the Control Panel via internet. Depending on the user name specified in the order and the unique Hardware ID, the Control Panel creates a registration key and sends it back to the program. – The program is automatically registered.